Possibly our most favorite rail photograph of all time – with kudos going to Kat at Emotions Photography in Denver Colorado. 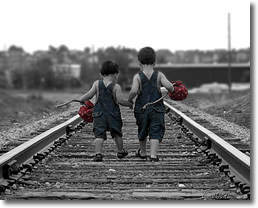 Ready to set out on their rail adventures, these two adorable buddies venture down the track, hand in hand. Kat has the talent that goes far beyond when you are looking for great photography. Don’t miss the chance to let a true professional capture these timeless moments! © Copyright Rail Photographs All Rights Reserved.